A few months ago, I discovered the Fate Role-Playing Game (RPG) system. It made a pretty crazy impression on me and I think it gives the GURPS system (which I talk about here) a solid run for its money. GURPS still has the massive edge on source books and a lot of brainstorming tools, but the Fate system is winning me over as a tool for writing fiction, in the realms of characteristic checks and a bit on character generation. 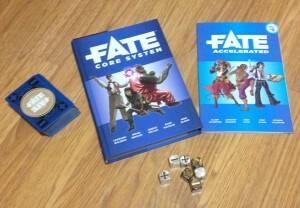 The Fate RPG is available as a core ruleset and as an Accelerated Edition. 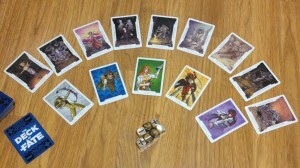 To help players use the system there are dice and a special Fate deck. Fate, now in its 4th edition, used to be FATE (Fudge Adventures in Tabletop Entertainment), which makes sense because it is heavily based on the old FUDGE role-playing system. Fate is a generic (not tied to a specific genre or setting) and highly customizable RPG. One nice thing is that Fate doesn’t use traits. So there aren’t any characteristics to roll up or compare dice rolls to. You don’t have to worry about Strength or Intelligence or other standard RPG stats. This works very well for our purposes in writing fiction and just introducing fog and friction to our active scenes. That’s not to say that Fate is dice free. Fate uses special dice, known as Fate or Fudge dice. The dice have a +, a -, or a blank on them. (If you can’t get a hold of some from your friendly local game store, you can use a standard D6 and just use it like a D3, for the same results). Additionally, in my experience so far, the Fate RPG strikes me as more of a cooperative story-telling experience rather than a traditional RPG, which again, works in our favor if we want to use it to help us write. For character development, Fate uses a system of Aspects that define your character. These are very high concept notions. In fact, Fate calls one of the Aspects the High Concept and this is what defines your character. So what Fate is looking for here is stuff like “World’s Greatest Swordsman” or “Fastest Gun in the West”. For our example here, I’m going to say that our character’s high concept is “Expert Treasure Hunter, part-time grave robber”. That starts painting a picture of the character immediately. The next thing you need to come up with is another Aspect called the Trouble. This is the key flaw that will help define the character. This could be something like “Can’t walk away from a fight” or some other similar geis, or it could just be something simpler like “Bad with money”. Obviously, the more involved the Trouble is, the more useful it will be. For our example, let’s use “Snakes, why did it have to be snakes” as the Trouble. Then you go on to Phases which help define the character in relation to other characters. So now our players would meet and write background for other characters he’s going to share the story with. So in this case, our example character (we’ll call him Indiana) will meet another character with the High Concept of “Best Digger in Cairo” (we’ll call him Sallah) and then we need to go through the phases and write backstory about how they knew one another. Normally, this would be a collaborative process, but since we’re using this system for writing fiction instead of role-playing, we get to do all the collaboration all by our lonesome. We’d then go through and develop specific Skills (Fate assumes that everyone can do all the skills, it’s just that characters might be better at some than others) and Stunts. Fate also uses Fate tokens to govern how many times a player could reroll the dice or invoke an aspect to get out of a sticky situation. For instance, our hero is in the thick of things and outnumbered 3 to 1 in a fight. He uses a fate point to invoke his Aspect of “deadly with a whip” to help him get out of the situation. He could of course invoke his Trouble to add a complication to the story and gain a Fate token. In gameplay it keeps things fun, fluid, and insures that complications arise all the time. For writing, we could use the fate tokens to govern how often a character might perform certain actions to avoid Mary Sue syndrome. It’s a very cool mechanic to keep things from getting out of hand. As far as the dice rolling goes, that marries up with a ladder that defines degrees of success. Along with any extra bonuses a character receives from their chosen skills. If a character rolls four +’s, then they’ve succeeded extraordinarily well, and in the opposite, if they roll four –‘s then they’ve probably failed catastrophically. 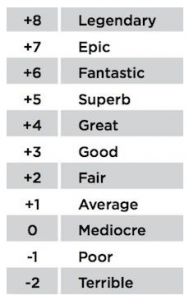 Fate calls this the Ladder, and I think this is a great way of leveraging the system to keep characters honest and grounded, avoid the Mary Sue, and keep things exciting (and dangerous). Of course, as writers we have the privilege of ignoring results we don’t agree with or that don’t fit in with the plot. If dice don’t tickle your fancy, the producers of Fate also offer a deck of cards which give you the same odds and include set of Arcana cards that merge perfectly with the Fate Accelerated Edition’s Approaches (which I’ll get to in a sec) and lets you randomly determine some Aspects and Approaches. This is fantastic for generating quick secondary or tertiary characters. This shows some of the Arcana and approaches available from the Deck of Fate. That brings me to FAE (Fate Accelerated Edition). This is a condensed set of rules designed to get players into the game as rapidly as possible. Characters still have Aspects like the High Concept and Trouble, but FAE replaces Skills with Approaches. These are Careful, Clever, Flashy, Forceful, Quick, Sneaky and then you’d assign bonuses to them. For instance if I wanted our example to be Clever, I could assign a bonus value of +3 and that would become their defining Approach. The FAE rules lay out some archetypes as examples to demonstrate how the approaches work. For fiction writing, I almost prefer the approaches to Skills since you can tailor them more easily to specific characters. It’s really a very neat system. In fact, for my money, as a tool for story development, the FAE system is all we really need. But speaking of money, the Fate system will not hurt your pocketbook. I bought the Fate core rulebook, the FAE rulebook, and some Fate dice at my FLGS and I didn’t even break $30. If you don’t care about getting the hardcopy editions and if a PDF is good enough for you. Fate and FAE are available for a pay-what-you-like price. You can get the PDFs for the Core rules and FAE here at Evil Hat’s site. I know that the Fate system and more than a few Fate tokens and dice are going to be in my writer’s toolkit for the foreseeable future.